When I see one of these old-style heating and air conditioner control panels my temptation is to just go ahead and replace it. However, as these automotive HVAC systems age, they're developing problems in several different areas. With that said, certain symptoms exist that point directly to a failed heating and air conditioning control panel. As an example, if you push on the AC button to engage the compressor and the amber indicator light starts to flash this represents a sign of a bad control head. In other situations the light might come on and the compressor engages intermittently. This causes warm air to blow from the air conditioning vents. Throughout this article we'll talk about the different vehicles plagued with AC control head issues. Update: We have a new control panel added to this page that's starting to fail in extremely high numbers. You find these panels on 2002 through 2010 Chevrolet and GMC trucks. However, these trucks use the fancy climate control system with a digital display. You can learn more about it in the last section of this page. The problem becomes the inability to adjust the temperature from the heating and AC control panel. With that said, the main point of this article remains that a failed heating and air conditioning control panel represent only one of the possibilities. These General Motors cars and trucks have reliability issues in the heating and air conditioning systems. In some cases when you have a problem adjusting the temperature or changing the air direction it could be a failure of the temperature control or blend door motor. We supply a separate article that covers that problem. In the same respect, what if the driver’s complaint becomes the inability to control the blower speed. The AC control head is a likely suspect, but not the only one. Diagnosis of blower motor problems begins at the blower motor resistor control module. These parts also experience a high failure rate. In the first picture on this page we have an original equipment GM heating and air conditioning panel most commonly found in Chevrolet trucks from 1995 through 2002. They provided great service for many years, but they’re starting to fail at an alarming rate. From 2003 through 2008 General Motors redesigned the climate control panel and installed these new units in a ton of vehicles. They also provided an optional digital display. This unit also fails in high numbers and we cover it below. Some of the most popular ones include the Chevrolet Malibu and the Chevy Impala. The important thing to remember when ordering replacement parts is to get the one with the right buttons. Most of the control heads have a button for a rear defroster option. 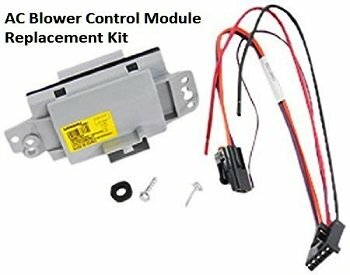 Keep in mind this control head carries a different part number for those vehicles when compared to automobiles without the rear defogger option. The rear electrical connectors look slightly different on the two most popular air-conditioning control panels so you have to double check compatibility. On the newer Chevrolet cars that use the updated design, drivers often complain about the intermittent operation from the AC system. Drivers also complain about the inability to accurately control temperature and fan speed. With that said, most often people report a problem with engaging the AC compressor using the button on the control head. Sometimes the light will flicker causing an intermittent condition. In addition, the re-circulation function which becomes important on a hot day may also provide intermittent operation. 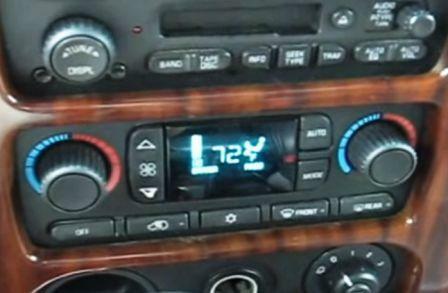 Car owners have documented, when controlling the fan speed or temperature, the unit turns off. We hear the same complaints on the older units installed from 1995 through 2000. Unfortunately, the Chevrolet trucks also have blower switch problems. First you must confirm the resistor isn’t the issue. The possibility exists that the blower switch failed in the control head. The switches are not replaceable . Therefore you buy the whole heater control panel. Keep in mind that I’ve seen people take these apart and clean up the contacts of the switch to get them working again. However, they don't seem to last longer than a year when this is done. If you plan on keeping the truck I would replace the part. Here's the problem with providing direct instructions for replacement of the HVAC control head. The procedure differs between year, makes and models. The older vehicles use vacuum lines connecting to the blend door actuators. Whereas the newer vehicles use electrical connectors. The difference between replacing a control head in a Chevrolet car versus a Chevrolet truck is quite different. Especially since the trucks use column shifters and the cars often have center consoles. Nevertheless, it boils down to removing the trim panels from around the unit. Remember, these plastic pieces are quite thin and you need to show some caution so you don't break them during removal. In a perfect world you’ll use trim removal tools to perform the operation properly. You can get a complete set of 11 specialized interior trim tools for under twenty dollars. The straight plastic blade that you need in this situation costs about 5 bucks at the big box freight store. However, using the flat edge of a screwdriver covered with a rag prevents unnecessary damage to the trim pieces. Also note that you can find specific videos showing you exactly how it's done on the video sharing services. We have a lot of other interesting air-conditioning articles that review common problems with older air-conditioning systems. One of the most popular of these posts outlines the worst car AC problems you can have on an old ride. The Chevy Tahoe AC control panel with climate control is starting to fail in large numbers. Speaking of numbers, that's what the problem becomes with the HVAC controller. Example, if you have it set for 75 and you want to knock it down one degree, when you hit the down button it jumps around. The precise control that the climate control system provides the driver is therefore ineffective. Drivers of the Chevy Avalanche also complain about problems with this panel. Some of the complaints include intermittent display screens. This is when the panel shows nothing or missing information. Although these issue sound like minor inconveniences the inability to make adjustments to the temperature can leave you roasting inside the truck on a hot summer day. The AC control panel that you can get through Amazon comes in a lot cheaper than you might find locally. This particular part fits a lot of different General Motors year, makes and models. Generally speaking, trucks between 2002 and 2010 utilize this part number. I personally installed one in a 2004 Chevrolet Tahoe with good results.